This 5 star fiesta is a fireball of passionate energy, throbbing with a unique vibrancy. It instantly absorbs us in the everyday lives, loves, issues and problems of the Latino community around 181st Street, New York City. For this is the most original musical to open in London this year, and easily the best. Its key strength lies in the portrayal of characters. No, not characters. Real, everyday people. 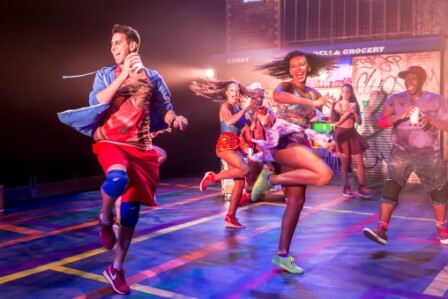 Sounds like a Cuban “Coronation Street?” That’s an accurate comparison, just add kaleidoscopically colourful Latin dance routines, some terrific songs (Lin-Manuel Miranda) and one outstanding cast and creative team. 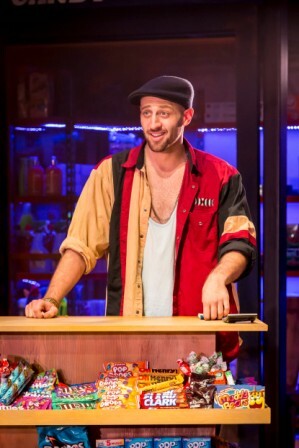 There’s the matriarch, Abuela Claudia (Eve Polycarpou), living above a bodega (licensed corner-shop to Brits), run by a man she brought up – Usnavi (Sam MacKay). There’s small business owners. Beautician Daniela (Victoria Hamilton-Barritt) and husband and wife taxi company proprietors Camila (Josie Benson) and Kevin (David Bedella) – a completely believable and wonderful pairing. The community’s youngsters are represented by their daughter, high-flyer Nina (Lily Frazer) and employee Benny (Joe Aaron Reid); alongside them are Usnavi’s cousin and sometimes assistant Sonny (Clive September) plus Daniela’s assistants Vanessa (Jade Ewen) and Carla (Sarah Naudi). All nicely done with just the right balance of frustration and resignation; while outsider Graffitti Pete (Antoine Murray-Straughan) deserves mention for a particularly impressive opening dance routine. The rest of the show is equally visually stunning. Every fast number is an excuse for choreographer Drew Mconie to have the cast thrill the audience with moves they ache to be able to echo. In that, ensemble dancers Philippa Stefani, Spin, Alexzandra Sarmiento, Reiss Hinds, Gabriela Garcia, Michael Cortez, Jocasta Almgill and Courtney-Mae Briggs, contribute immeasurably. Every quiet number is equally impressive, as director Luke Sheppard finds the crucial element at the heart of great musicals, truth. As Nina faces owning up to her parents in “Breathe,” we get an Olivier winning performance from a young actor who simply must have “West Side Story” staged specifically for her to play Maria. Heartbreaking “Atencion,” “Hundreds of Stories” and the argument “Enough” also all resonate with authenticity. The confirmation of the show’s quality is in “96000.” A lottery win is usually clichéd death to a storyline. Here, it’s a modest sum, credible and a ray of hope to the entire community. Indeed, every plot development is authentic, each person someone you instantly care for and about, and wish to champion. There’s comic relief too, and neat one-liners. Gossip Daniela almost steals the show, Ms Hamilton-Barritt ensuring that the laughter flows. If her baby turns out as talented as mother, then it’ll have a great story to tell on the chat-show sofa, “I stole a West End Show before I was even born.” A neat turn by Piragua Guy (Vas Constanti) also amused one member of the front row at the end. 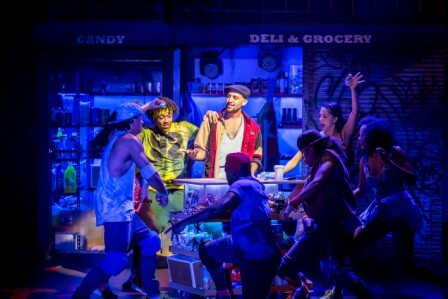 An evening “In The Heights” is as good as a week’s vacation in South America, from the moment you arrive and absorb the themed foyer bar atmosphere. The people are enchanting, the music is fabulous and the stories fascinating. Most of all, heart and soul you fall in love with the whole, and remain smitten, knowing life will always have colour while such communities exist. Don’t miss your chance to join it, even for a few hours. Photograph credit: Johan Persson, used by kind permission. 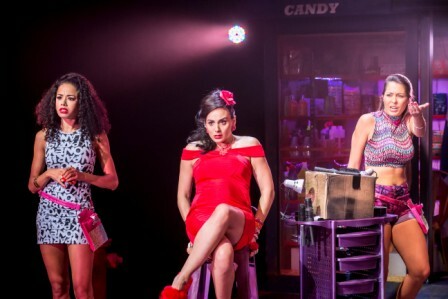 (From top): Sam Mackay as Usnavi and cast; Sam Mackay as Usnavi; The cast; Jade Ewen (Vanessa), Victoria Hamilton-Barritt (Daniela) and Sarah Naudi (Carla); Jade Ewen as Vanessa.